A fascinating historical account of a journalist’s study into a changing climate. The author grapples with the notion that varying weather patterns, almost instinctively, solicit a pessimistic influence on a person, as “the writer has never yet met one who was an optimist”. Aware of superstitions hardwired into the human psyche, the author reassures that any record-defying weather prophecy can almost certainly be corrected through historical comparison. However, armed with “figures to prove it”, the author discovers a distinct climate change occurring in temperature and rainfall that defies his ‘stable climate’ assumptions. Does the author fall victim to his own climate superstitions? Or is there really man-made climate change at play, brought about by human settlement and the development of land for agriculture? The author does however remain his own ‘optimist’, noting that whilst the summer months are getting warmer, “our winters are gradually being robbed of their terrors”. As well, the prospect of increased rains could mean, “millions in hard solid cash”, and with less burden on Government, “reduced taxation will follow.” ! CONCERNING weather, it may be accepted as an axiom that there are conservatives and ultra-conservatives, and meteorologists, too. During an acquaintance extending over many years with the last-named gentry the writer has never yet met one who was an optimist. Enthuse as you will over popular literature dealing with the various cycles and other schemes under which it can be shown conclusively that there is no such thing as a problem where weather is concerned, the meteorologist will turn you down cold. Even Mr. Bromley, amiable prophet though he be, is no exception to the rule. Go to him filled with hope after it has been raining hard for endless days and ask for sympathy and the verification of a new record established. You will not get it. He will refer to some bygone day when it rained .000934 points of an inch or more, or when the mercury was all out over the last fractional point of the scale. 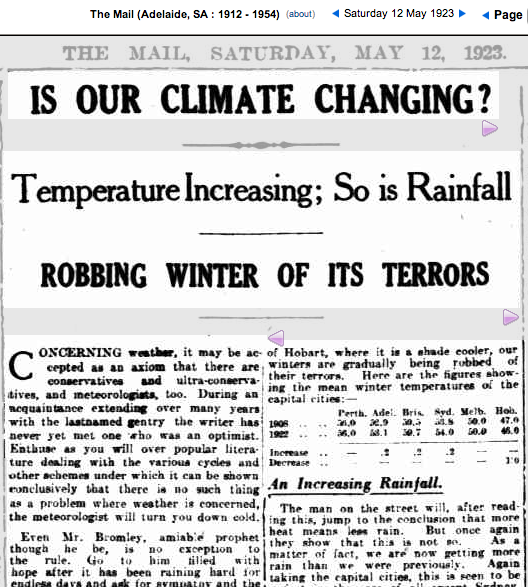 A distinct change, however, in the Australian climate which even Mr. Bromley cannot refute has been discovered. There are figures to prove it, and those figures are supplied by Mr. Bromley’s department. Interviewed this week one prominent Adelaide man said the public did not understand what rain meant to the State. It was not only a case of providing water — it was a case of millions in hard solid cash. If that be so, then one of the problems of the Federal Government has gone, and reduced taxation will follow as a natural course. Two things have happened to the Australian climate — it is getting warmer and the average rainfall is increasing. Just what has brought the change about it is hard to say, but no doubt there is a reason. Knibbs, in one of his early year books, places it on record that settlement and the treatment of land have a distinct effect on local conditions. Sydney, for example, showed a rise of two-tenths of a degree during the past twenty years, a change which he attributed to the great growth of residential and manufacturing buildings within the city and in the surrounding suburbs during that period. Again, the low-lying lands of the north coast of New South Wales, formerly free from frost, now have annual visitations. The theory is that with the cutting away of the trees the cold air, has an unimpeded flow to the low lands. Again, in “American Weather,” Gen. A. W. Grerly remarks on the subject of heat waves, “It seems possible that the frequency and intensity of such visitations have diminished on the Pacific Coast, since Tennant’s record of hot days (classing as such those on which the temperature rose to 80 degrees, or above, at San Francisco) indicates that their actual number has very materially diminished since 1839. For seven years prior to 1839 such days averaged thirteen yearly, and since that time up to 1871 the average number is but four. The immense quantity of land placed under irrigation and the vast increase in vegetation are obvious reasons why there should be some diminution in this respect. AT the time of this ‘abrupt’, ‘unprecedented’ Climate Change, carbon dioxide pollution was at 320 parts per million.